When looking to buy new cookware, one of the most loved has to be that of copper. Mauviel have been making beautiful copper cookware since 1830, and they make them well. If you are lucky enough to have the budget to buy quality and high end copper cookware, then Maiviel cookware is a good choice. Their copper cookware with a stainless steel interior allows you to cook everything to perfection. Copper also looks stunning in any kitchen. 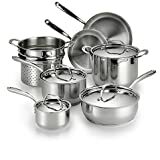 Below is our Mauviel M’heritage M250C 9-piece 2.5mm Copper Cookware Set Review. The following are the most features of Mauviel M’heritage M250C 9-piece 2.5mm Copper Cookware Set. The cookware consists of thick copper that measures 2.5-mm in thickness. The overall ratio is 90 percent copper to 10 percent stainless steel that is used for the interior. The copper covers the outsides and bottoms of each pot and pan. Copper is one of the most effective conductors of heat that you can have in the kitchen. It heats foods evenly and therefore eliminates any hotspots that may appear in your cooking. What copper gives you is wonderful control over your cooking with regards to temperature, it heats gently. It is therefore perfect for gently simmering soups and searing meat. Each pot and pan features a thin coating of stainless silver that works well with the copper to evenly distribute the heat in the bottom of the pan. Stainless steel is perfectly safe to cook on and will not tarnish or alter the taste of your food. The interior of each piece of cookware is highly polished. This presents a nonstick surface on which to cook food. This also allows you to cook at much lower temperatures and without the fear of burning your food. You also use less oil, so cooking is much healthier. All of the cookware pieces come with cast iron handles that are smooth and soft to the touch. They are long for easy access away from hot food and liquids. They have been ergonomically designed for comfort when you need to manipulate a pan while cooking. They are incredibly sturdy and feature stainless steel rivets. The skillet and sauté pans have extra long handles for more added safety and each handle is placed high on the pan’s edge. The large stockpot features handles that are placed outwards for easier grip and manoeuvrability. This cookware set features 4 differently sized copper lid inserts to match accompanying pans. All pots and pans have a lid except for the skillet. The copper lids each feature their own cast iron handle that stays cool to the touch when the pan is placed on a hot stove. They are also quite large so are easy to grip in order to allow you to lift the lid. All of the lids fit perfectly and sit on top of their designated pan. They seal in moisture while you cook and help to keep food at the desired temperature. The set features everything you need for everyday cooking as well as creating meals for those special occasions. 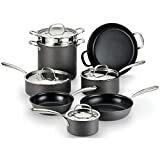 The set includes a: 1.9 quart sauce pan with lid; a 2.7 quart sauce pan with lid; a 3.2 quart sauté pan with kid; a 6.4 quart stock pot with lid and a 10 inch skillet pan. The cookware set allows you to cook an entire meal for your family from roasting meats, boiling your vegetables and creating a delicious sauce. Q. Where is this cookware made? A. It is made in France. Q. Can this cookware be used on induction hobs? A. Sadly not, but it can be used on any other type of cooker top. 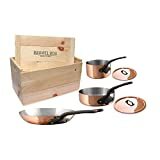 The Mauviel M’heritage M250C 9-piece 2.5mm Copper Cookware Set is the very best in cooking with copper. It looks stunning, is easy to keep clean and highly polished, is lightweight and easy to manipulate and you have ultimate control over your cooking. Cooking with copper is incredibly economical and ensures that your food is evenly cooked with no risk of hotspots. Copper cookware is expensive, but this is due to all of the reasons that have been stated. Copper will last a lifetime so investment in a high quality copper cookware set is very advantageous. Bourgeat 13 Piece Copper Cookware Set Review – Should I Buy ? Calphalon Tri Ply Copper Review – Should I Buy ?